Saibal Chatterjee is a national award-winning film critic, screenwriter and editor. Starting his journalistic career in 1984 on the news desk of The Telegraph, Kolkata, he moved to New Delhi in 1990 to join The Times of India. He was a part of the editorial team that launched Outlook magazine in 1995. 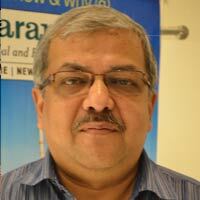 Currently, he is a senior editorial consultant with Financial Chronicle. His film reviews appear on ndtv.com. He also reviews Hindi films for Press Trust of India (PTI). Over the past two decades, he has covered numerous major international film festivals and entertainment industry events in Cannes, Toronto, Los Angeles, London, Melbourne, Bangkok and Abu Dhabi. He has scripted three award-winning documentary films – Dream of a Dark Night, Harvest of Grief, and Dil Ki Basti Mein, all directed by filmmaker Anwar Jamal. He was a key member of the editorial board of Encyclopaedia Britannica’s Encyclopaedia of Hindi Cinema, published in 2003. He is the author of Echoes and Eloquences, a book on the life and work of poet-lyricist-filmmaker Gulzar. He co-edited a book titled Bollywood Hollywood – The Politics of Crossover Films, published by Vani Prakashan. He works as an editorial consultant and columnist and writes on art, culture and cinema for various media outlets in India and abroad, including BBC online and the Sharjah-based newspaper, The Gulf Today.